The name of a leading industrial workwear specialist was on view from John O’Groats to Land’s End when a group of dedicated fire personnel recently undertook a grueling cycle marathon to raise funds for charity. 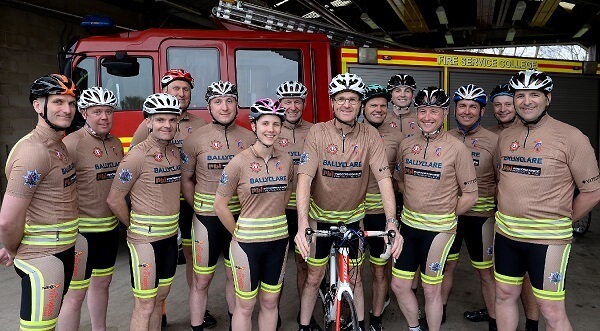 Wearing special cycling ‘fire suits’ which were sponsored by Ballyclare Limited, the 18-strong team of riders from the Oxfordshire Fire and Rescue Service completed a 1,006-mile trek in just 14 days. Anyone wishing to make a contribution to the team’s fundraising efforts should go to Virgin Money Giving, (virginmoneygiving.com/team/jogle2016). Picture caption: Proudly sporting shirts sponsored by industrial workwear specialist Ballyclare Limited are the Oxfordshire Fire and Rescue Service cycle team, who recently completed a marathon fundraising trek from John O’Groats to Land’s End.